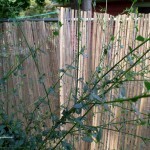 Home » DIY home and garden craft projects » DIY ~ Beautify a Chain Link Fence with Bamboo! DIY ~ Beautify a Chain Link Fence with Bamboo! Before ~ This is a view that needs help! After ~ more privacy and a nice backdrop for plantings! 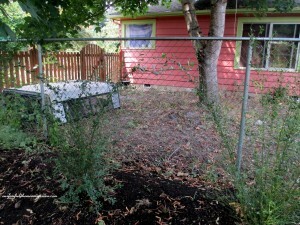 What do you do if you fall in love with a home surrounded by an ugly five foot high chain link fence? It is a great enclosure for pets, but aesthetically not so pleasing. This was my daughter’s dilemma when she purchased a darling cottage in Oregon. There are vinyl or wooden strips you can thread into the fencing, but she wanted to cover that fencing as well as make her yard more private. Bamboo screening/fencing to the rescue! Bamboo screening comes in different heights and can be attached to the existing fence. There are poles and split bamboo as well to choose from. It is quick, easy and way less expensive than tearing out the chain link and replacing it. 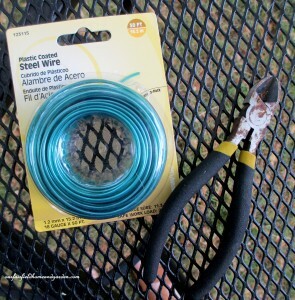 You will need plastic coated 18 gauge steel wire and wire snips. Cut the wire in 6 inch long pieces. Here are the three materials you will need for 65 feet of fencing. Adjust accordingly for your fence project : Bamboo screening/roll fencing (we bought 5 rolls of 13 ft by 5 ft split bamboo screening), 2 rolls of 18 gauge plastic coated steel wire and a pair of wire snips. Cut the wire into 6 inch pieces and stow in a bucket. Fencing for this project cost $186.95. Wire added on $11.94 and we had wire snips for a total of $186.95. Just three easy steps, but definitely a two-person job as the bamboo screening is floppy until secured. We found it is best to have a person on each side of the fence when attaching the screening. First, unroll and stretch the screening out along the fence to be covered. You may need a few lawn chairs to prop it in place until it is wired on. Next, with a person on either side of the fence, thread pieces of wire through the screening and chain link fence, twist the ends together and turn any ends inward. We found it was much more efficient to attach the top of the entire run of fence first so it was held in place as we attached middle and bottom wires. Wires were attached every foot or so across the top, middle and bottom. Step # 2 ~ Insert the wire so that it catches the fence as well as the wire portion of the bamboo screening material. 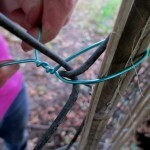 Step # 3 ~ Twist the two ends of the wire together and tuck the ends in. 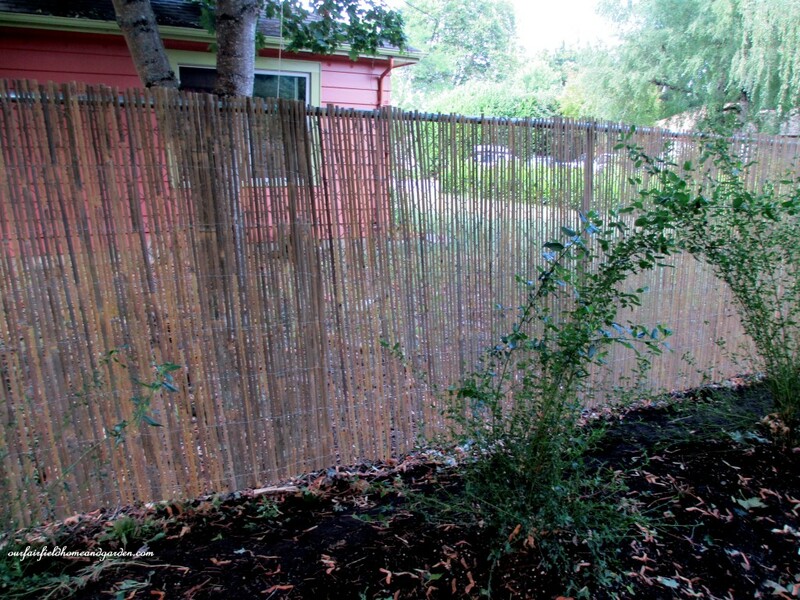 After ~ Five foot high chain link fence is softened by the split bamboo fencing, screening the side yard. 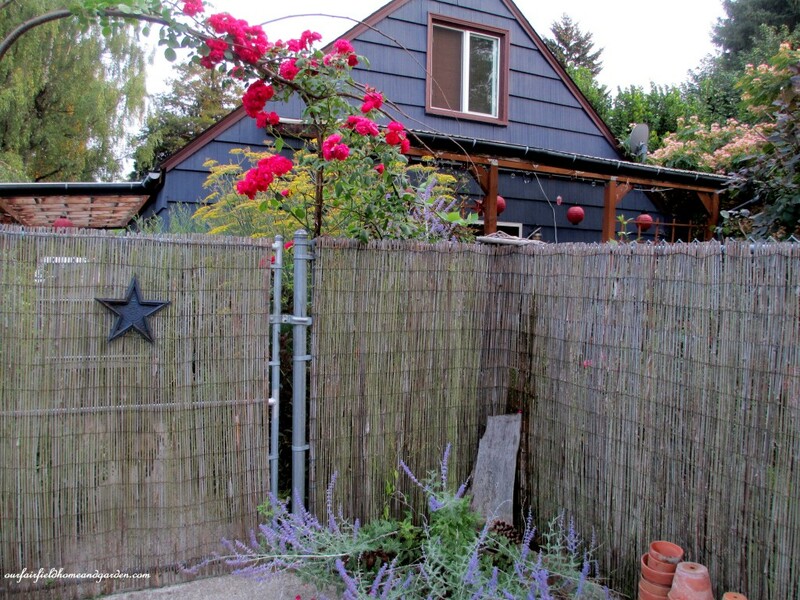 Bamboo fencing ages to a soft gray and is very durable. Create privacy and a beautiful backdrop for your garden plantings by covering chain link fencing with bamboo! Very nice, Barb – thanks for the great idea. Thanks, Jacki! This screening goes up quickly and ages to a beautiful soft gray. My daughter has loved it and received many wonderful compliments on the transformation! Thanks, Sia! I am so happy to hear you think so! 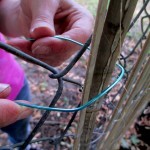 This was an easy, inexpensive fix for the MILES of chain link fence around my daughter’s double lot. Thanks for writing, Jackie! Sorry to hear you have a difficult neighbor. Maybe you’ll need to add trellis and vines too : ) Luckily, my daughter’s neighbor is cordial, just a bit messy! My daughter lives in town in Eugene, Oregon and there are no high winds to contend with there. The screening is securely fastened to the chain link fence with wire. I suppose if your area has high winds you would have to put more fasteners in or look for a more sturdy alternative. how long will the bamboo last in southeast Michigan [Motown in particular]? JL ~ There were two kinds of bamboo screening to select from when we purchased ours. One was many tiny poles and the other was split bamboo. I would imagine that the pole bamboo would last much longer. It is what we put in the front of my daughter’s house and it looks great after more than three years.We chose the split bamboo for this side yard that gets little use and has bushes growing in front of it that will be quite large. Check with the stores that carry it in your area and see what they recommend for durability in your climate. Love this!! I added the vinyl privacy lattice to my chain link fence!! I am now following you wherever i can…..
Oh, Miss Debbie-Dabble, Thanks so much for checking out my blog and writing! I am so happy that you are joining me on my other social media locations too! What a compliment! Me again!! I have added your blog to my blog rolls too!! Very nice Barb..Love the natural look of the bamboo! Thanks, Nancy Blue Moon! 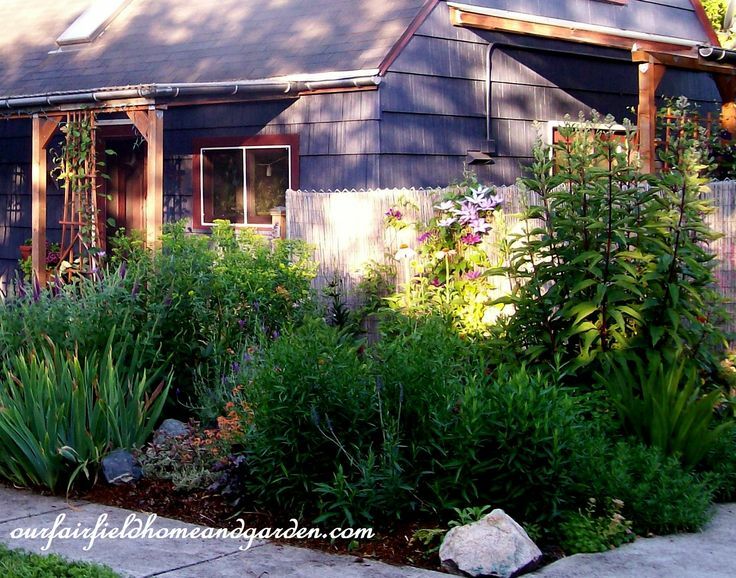 It has a very zen, tropical or cottage garden look depending on your plantings! By the way, your daughter’s cottage looks positively enchanting and adorable! I’d love to see the inside! Lorraine ~ It is a tiny little cottage with the footprint of a two car garage – which is what it was at one time! Two rooms and a bathroom downstairs with a nice size bedroom upstairs. She has to be very efficient but there is a lot of storage with built-ins, etc. What a great idea! I am pleased to see a renewable resource being used – I am not a fan of the plastic strips. I would like to try this in my own yard. I am wondering where you purchased the bamboo screening. Lowes? Home Depot? I live in Manitoba Canada which is just above Minnesota and North Dakota. Hi, Jennifer! We purchased this at Jerry’s , which is like a Lowe’s or Home Depot, but in Oregon, where my daughter lives. Now is the time to get it as this is a seasonal product and you might get lucky and find it marked down! 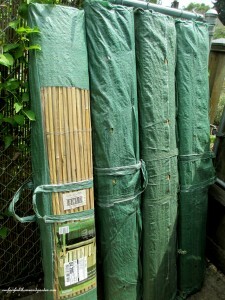 For the best durability, make sure you get the tiny bamboo poles (roll bamboo screening). Split bamboo is pretty but you probably have severe winters and it might not last as long. Be careful not to get reed screening which looks similar but will fall apart after just a season or two! Good luck on finding a deal and doing your project! I loved reading this article and feel the bamboo really dressed up the yards by hiding the ugly fence. If by any chance, I end up staying here in this house, I will definitely add this to the project list. I love it, the privacy is allows and more importantly to me, the low cost. Thanks, Terri ! 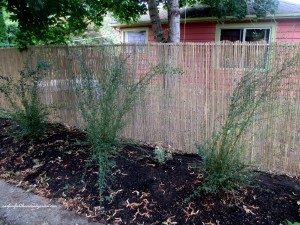 The bamboo is an affordable way to add privacy and dress-up your fencing. Because you wire it on, it can easily be taken down as well, if you move or decide to do something different! Wow! I’m totally impressed! It’s actually a great idea. I’ve never thought about putting bamboo to hide the chain link fence. It really did spruce up the fence. It looks so much better than how it was. You did a great job. Very brilliant idea. Thanks, Brandi ~ Although my daughter was thrilled to have a fenced-in yard for her pets, all that chain link fencing did not have much curb appeal. This seemed to do the trick! Thanks for coming by! Sad to hear that your neighbors are neglectful, that is hard to live next to I’m sure. If Bamboo screening won’t work in your location, lattice panels might help obscure the view. Hope one of these helps your situation. That view did need some sprucing up! I think the finished product looks great! Bamboo was a great choice, especially because it ages so well. Thanks, Marble Falls Fence – It isn’t the traditional fence, but it did the trick at my daughter’s house! You are so welcome, Donna! I am glad for your visit and thank you for your comment!